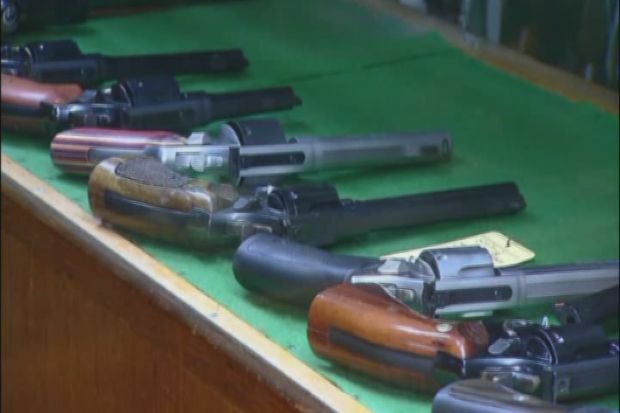 A gun show will go on this weekend in Stamford despite cries from around the state that it is just too close, and too soon after, the Sandy Hook shootings. Newtown is 40 miles away. The East Coast Firearms Show at the Stamford Plaza Hotel is organized by Westchester Collectors which is a Mahopac Falls, NY based promoter. The flyer says the show offers the "best of the best of vendors, offering 250 tables of antique and historical arms." Opinions in and around Stamford were mixed, but organizers were setting up at the hotel all day Friday. Signs around the lobby indicate the show is still happening Saturday and Sunday. Similar ones by the same promoter in Waterbury and Westchester County were cancelled. "It seems insensitive to have the event continue," Stamford Mayor Michael Pavia said. He feels the timing of the event is just not right, just over three weeks after the Sandy Hook School shooting. Stamford Police Captain Richard Conklin says he understands that some aren't happy about it. But since it's being staged staged at a private facility they can't cancel the event. The organizers of an antique gun show in Stamford have decided to go ahead with the event even though other similar events around the region have been cancelled. "When you think of gun shows this is not your typical gun show," Conklin said. He adds that this is a show for weapons collectors and nothing dangerous. He says he's dealt with the organizer before and never had an issue. "We're going to maintain a presence there to ensure that they continue to be compliant with state, local and federal laws." The police captain says the track record of Westchester Collectors has been good. They've had this show for seven of the past eight years in the community, noting they'll be there in at the hotel to make sure every law is followed to a tee.